You might be wondering why, when we are all under such close surveillance, that “terrorists” are still able to attack us. When all our emails are being read, our browsing history examined, our phone calls listened to, and even our movements on the streets picked up by cctv, how did the events of Friday 13th November in Paris ever happen? There is a clue in the date… but first of all, I should explain how we’ve been viewing the issue of surveillance from the wrong end of the telescope. The purpose of such monitoring of our every word and move is so they can spy on their enemy, which is us. They already know who all the terrorists are, because it’s them… by which I mean, the criminal shadow governments that are behind those carrying out the surveillance, and also those carrying out false flag terror attacks. What is a ‘false flag’ attack? You can go back hundreds of years and find that most “terrorist attacks” which start wars are actually false flags attacks. So what do I mean by “false flag attack”? It’s a Navy expression, because it came from warships displaying the flag of the enemy to cause confusion in different ways, in order to pursue a covert goal. In short, today, a false flag attack is when side A dresses up as side B to attack its own followers. The followers of side A then indignantly demand righteous war against side B, who is often completely innocent of the crime. Famous known false flags include Operation Northwoods, the burning down of the Reichstag, Project TP-Ajax, the Kurcha Incident, the Second Sino-Japanese Incident and the Gleiwitz Incident during World War 2. There are many who believe that Pearl Harbour was a false flag to get America into World War II – it was certainly convenient to those aims. The earliest false flag that I’ve found was in 878 CE, when I think King Alfred the Great set fire to Glastonbury Abbey and then blamed it on the Vikings. After that, all the men of the ‘three counties’ gathered around him at Egbert’s Stone in Selwood Forest for a “Crispin’s Day” type of rousing speech before all setting off for the final battle with the Vikings which was decisive in Alfred’s winning of the throne. There is also overwhelming evidence for 9/11 being a false flag – to gain mass consent for the invasion of Afghanistan and Iraq. There have also been various highly publicised incidents in the last few years involving “lone gunman shootings” such as Sandy Hook, the Aurora cinema, Oregon… actually too many list here… which people believe are to support Obama’s agenda of gun confiscation. If that was the aim, it has failed, because if anything, there has been an upsurge in gun ownership during the last couple of years. There is plenty of evidence that the Boston Bombing was also a false flag, to get the American public used to the idea of ‘lock down’ and martial law. The Paris attack of Friday 13th November 2015 will no doubt turn out to be a classic of this genre which, like all modern-day false flags, are huge theatrical operations that involve the whole world watching on media screens, to increase emotional buy-in and thus to gain permission for the next act of war that they want to perform. Paris will almost certainly be about bombing Syria, because the very act automatically evokes the all-for-one-one-for-all Article 5 of the North Atlantic Treaty, which states that an attack on one ally shall be considered an attack on all allies. In other words, whenever one of the member countries is attacked, then every member country has to retaliate. Ever since the summer of 2013, when many of us wrote to our MPs over British foreign policy towards Syria, and the ensuing vote in Parliament which went against invasion there, the shadow powers have been trying to find a way to get in with our consent. Their latest ruse has been the invention of ISIS, a motley collection of assorted Arab mercenaries being largely funded by Saudi Arabia, armed with stinger missiles via the US Benghazi embassy and trained in Jordan by CIA black ops. The only reason that ISIS and Israel leave each other alone is … well, you don’t really need me to finish this sentence, I’m sure. Rupert Murdoch tweeted on Saturday: “Paris outrage not an attack on all humanity, but an attack on us. ie, Western civilisation!” I replied to him: “You & your cronies at the oil field on the Golan Heights could stop all this carnage in a heartbeat, so don’t be a hypocrite.” Murdoch is a major shareholder of this oilfield located at the Golan Heights which is on the Israel/Syrian border. The other aspect you’ll need to get your head around, if this subject is new to you, is that of the role of ‘crisis actors’. Crisis actors are actually paid actors who take part in these false flag events – either as victims, innocent bystanders caught up in it, or family members of victims. Many crisis actors have been spotted at different false flags by the alternative media, such as this poor woman who it seems just can’t catch a break! There are crisis actors, but there are also real people too – unwitting victims to whom the tragedy is real, and there are people who really die – because to the puppet masters of this Theatre of the Macabre, if we get in the way, we’re just ‘collateral damage’. So how does one avoid being caught up in one of these Schlocky Horror Shows? Well, there is no sure way, but now that you have all the information about who is causing them and why, there are some simple house-keeping tips that would help. The most important piece of advice I can give is don’t live in a city or a large town. The psychos who’ve turned the whole world into their Hollywood movie set need their Friday the 13th Fright Nights to be easily accessible to press and film crews. The whole point of these staged attacks is to manipulate consent for the next atrocity that they want to perform on the world stage and, to optimise that effect, the attack events need to be beamed to the largest possible audience. If the media circus is held up by having to wind down unfamiliar country lanes and stopping for cattle crossings, they won’t get there in time to hear the all-important “This is for Syria!” from the mouths of the Freddy Kreugers, and so the moral of the plot may get lost. Secondly, refrain from watching the event on social media or television while it’s unfolding, because this is how they make us feel involved. Then we think it’s down to us to ‘do something about it’, which is their cue – before the blood on the pavements is even dry – to instantly provide us with their recommended ‘something to do’. Watching it live also makes us part of the trauma . Do you remember how they kept running the footage, all day long, of the Twin Towers collapsing on 9/11? It was to traumatise us…. and when we’re traumatised and in shock, we lose all our decision-making ability and so are happy to let others make the decisions about how to respond for us. Thirdly, don’t turn your profile picture into something that shows solidarity – you play straight into their hands by using their ready made memes because that helps to spread the terror around. The Eiffel Tower as a ban-the-bomb symbol appeared on social media even as the attacks were still happening … almost as fast as the pre-printed banners of Je Suis Charlie after the Charlie Hebdo shooting, another likely false flag. Remember, their motto is ‘Ordo ab Chao’ – order out of chaos; they create the chaos so that they can then bring in the order, on their own terms. If we want this Reign of Terror to end, we have to wrest the controls of the mass media machine away from those who own it, the Zionists, and create our own media. This will be difficult, but not impossible. It’s the only way, because without the media covering it, there’d be no more oxygen of publicity and thus no further point in putting on these bloody shows. In the meantime, I reckon the best thing to do is move out to the countryside. The irony of this is that the agenda of the New World Order (UN Agenda 21) is to have us all living in cities. They might change their tactics when they see us all leaving. I created a facebook page relating to events such as the Paris attacks – which are designed to keep the general level of consciousness lower. https://www.facebook.com/wewillnotbbelieveyou/ 911 was the most substantial attack on human consciousness – not just because of the trauma induced, but because of the technologies that were employed (which few have looked at the evidence for). 100% agreed. I love reading posts like this, it makes me feel less frustrated about the enormity of the lies and injustice we are up against. Thank you for your insightful article, Ishtar! 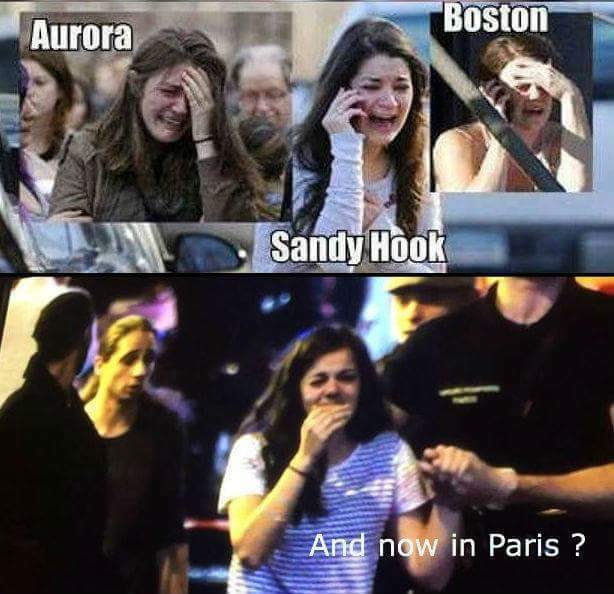 What kind of character defect and loss of humanity would you need to have to be a crisis actor? What happened to their consciousness? Is the need to take just any acting job so urgent? I think the “actors” are more agents than Hollywood wannabes. They couldn’t sleep at night otherwise. The blonde Sandy Hook mom is another who pops up all over the place. Sickos.